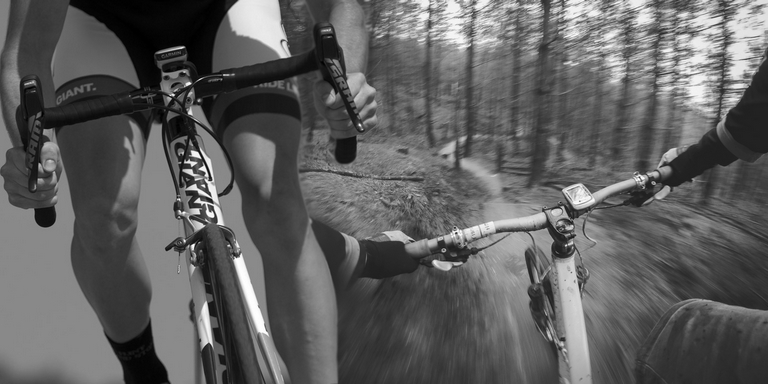 Barely a week goes by without our members pushing their own physical limits both on and off the bike. But two of our up and coming superstars have been putting the name Tír Chonnail Gap CC on the map right throughout the season. Road racer, Jamie Meehan, has lit up the youth scene with some results that belie his age. Competing in an age category against boys a year older than him – and therefore allowed bigger gearings – he has regularly featured in the top 10 in events with national and international fields. Meanwhile, our downhill mountain biking ace, Adam Voss, has been traveling all over the country to compete in the Irish Downhill Mountain Biking Series, riding the same terrifying descents as among others, World Champion, Colin Ross. Adam is competing in the Sports category, and just watching him is enough to have you hiding behind the sofa! It is wonderful to see our club represented at national level in two completely different disciplines. Adam and Jamie have both worked really hard this season, and it has paid off in their results – an inspiration to the rest of us wannabes. The award winning Errigal Youth Tour this year attracted over 300 youth riders from over 20 countries. Just because it’s in our back garden, doesn’t mean it’s a local event! Jamie and team mate, Thomas O’Shea were competing in the top youth category, Under 16s, but both are still under 15 and racing on restricted gears. The Youth Tour is a 4 stage event with 2 road races, one with a serious (and we mean serious) climb to finish each lap, a time trial and a criterion race. Jamie finished day 1’s road race in the top peloton, one of 21 riders given the same time and equal 4th position. Stage 2 was the time trial, with the boys disadvantaged by their gearing, but warmed up for the road race. Jamie’s performance in the second road race was even better, finishing in the 2nd group of the peloton, in equal 7th position, just 6 seconds behind the stage winner. Unfortunately, Jamie crashed on the final stage so was unable to record an overall position, but Thomas put in a courageous performance in the criterion to boost his placing. At the National Youth Championships in Ballymena young Jamie produced a brilliant performance, enhancing his growing reputation with a fantastic 6th place in the U-15 road race. Thomas O’Shea again put in a strong ride to finish in the peloton as he too continues to improve. 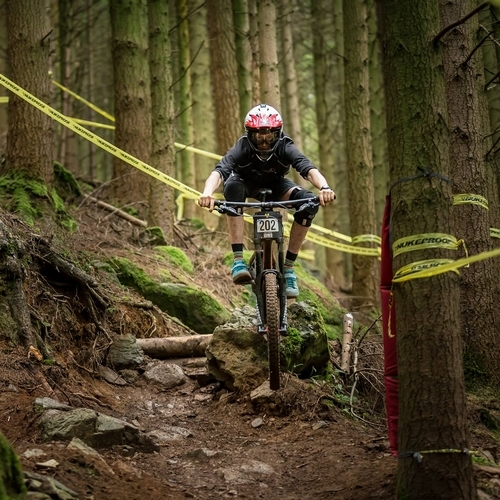 The Irish Downhill Mountainbiking Series consists of 6 events across the country with cumulative points counting towards the national championship standings. Bad weather caused the first two events of the year to be cancelled for safety reasons, so the series became a 4-run shoot out, where a single mistake could prove extremely costly for any competitor. Adam’s first race of the year was in Bree, County Wexford – a fiercely competitive event, with Adam finishing in a creditable 14th place. 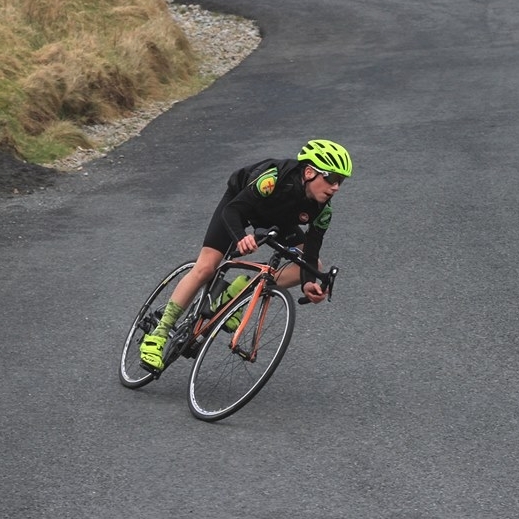 His 2nd round in Rostrevor was watched by an army of supporters from the club, with the mountain bikers organising a weekend away to coincide with Adam’s event. Buoyed by the support, Adam put in two fantastic runs and finished 3rd, pushing him up to 4th in the overall standings. The final event of the year took place at Bike Park Ireland on 23rd September. A sustained period of stormy weather toughened up the course, conditions which suit Adam. His seeding run placed him in 2nd for the race run, but disaster struck and he lost his chain. No bother to our Mister Super Cool, he carried on, and although it cost him a few seconds, he was still able to record his second podium placing of the series, consolidating his overall 4th place. Adam’s goal at the start of the season was Top 10. He smashed that, congratulations! 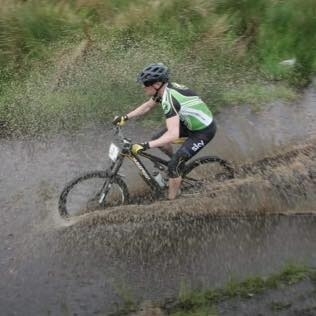 The National Championship Event took place in July at Bike Park Ireland. Adam finished 23rd, on the same time as the 3 riders immediately above him, the 4 being separated only by hundredths of seconds. 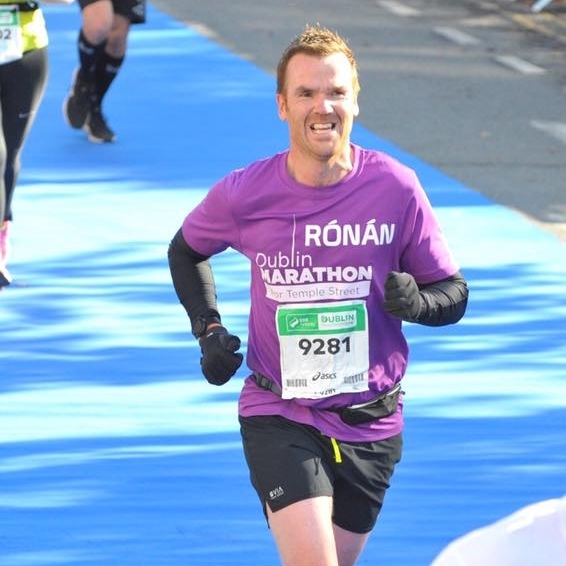 Ronan’s journey started 2 years ago in plaster with a ruptured achilles tendon, and almost ended before the marathon with a stress fracture in the foot. But Ronan is made of tough stuff, and when he decides to do something, he does it! 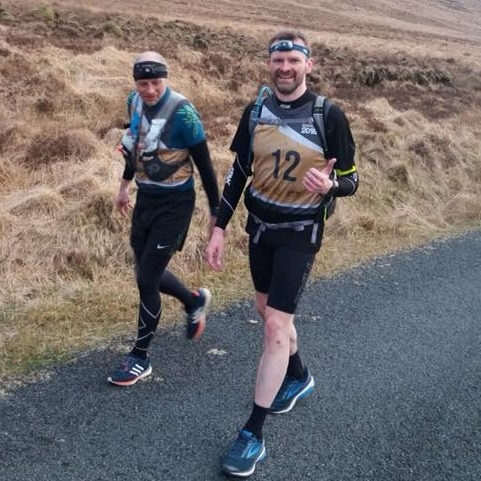 1,000km of training later, Ronan stood on the start line hoping to beat 4 hours and hoping to raise €1,000 for Temple Street Children’s Hospital. He smashed both targets: 3 hours 43 minutes, and €4,400 so far. Two massive well dones, lad! This mountain biking event requires participants to complete as many laps as they can of the Castlewellan Mountain Bike Trail in 8 hours. As if that wasn’t hard enough, the organisers added a few tricky sections to the route this year to sort the men from the boys. Our own Gerard Curren can definitely consider himself sorted. He has put a lot of work in and training paid off as he completed 9 laps in the allotted 8 hours, finishing in a very respectable 3rd place. Imagine a 6 stage race, where stage 6 on its own is a marathon! That is exactly what The Race is. A total of 64km of running, 164km of cycling, 15km of kayaking, and a 5km vertical run/walk/climb/scramble. This is the challenge undertaken by Aidan Fallon, completing the epic event in an amazing 18 hours and 7 minutes for 16th place. Three professional mountain bikers are the foxes, 500 amateur bikers are the hounds, all racing down the side of a mountain at breakneck speed. Carnage doesn’t even come close to describing the event. The skills required include (obviously) staying on the bike, passing other riders on tracks barely wider than the bike wheel, and avoiding the inevitable pile ups. Adam Voss took on this challenge and despite a fairly major looking crash, managed to reach the bottom of the mountain in one piece and in 48th place. The Skoda Series consists of 4 sportifs at various locations across the country. Congratulations to Nonie McGirr and Mary Rice on completing all 4 legs of this challenge. That’s a lot of kilometres! Our club members were out in force for this road race series, with Peter McGee winning the 2nd prize overall and Jamie Meehan winning 1st junior overall. Cess Holden took 2nd lady in the Ballyshannon Round The Houses event, whilst Peter, Jamie, Mairead Cranley, Thomas O’Shea, Michael McKeown and Alan Breslin all placed in their categories during the summer series. The WAAR event is a combination of running, cycling, hiking and kayaking. Congratulations to Peter McGee who took the Sprint Event title, and to Ronan Harper and Michael Morrow for their strong performances in the full event. Congratulations to Michael McKeown on his 3rd place – pretty impressive for a roadie! Keep an eye on our facebook page for the latest news of what our members are up to.